Start your mornings with a cup of joy with Bru instant coffee. Prepared with robusta beans, this instant coffee mix includes a hint of chicory to enhance its delicious, rich coffee flavor. The advanced processing technique preserves the fresh coffee aroma for a great coffee experience. This coffee mix allows you to enjoy hot, refreshing coffee instantly. Make a cup, the way you like your coffee to be. Buy Bru instant coffee in this pack now and look forward to those precious cups right away. 1. 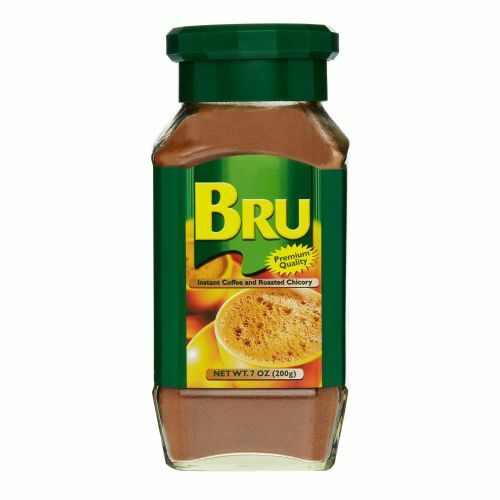 Add 1 teaspoon of Bru powder to a cup. 3. Add sugar to taste, stir well & enjoy a yummy hot cup of Bru coffee. 1. Add 1 & half teaspoons of Bru Coffee powder in 150ml chilled milk. 3. Pour into a glass & top it up with ice cubes.